West coast wizards the wait is over, as The Wizarding World of Harry Potter opens in Hollywood on April 7th. Along with the magically themed park and attractions come exquisitely detailed food, straight out of the books and movies. Buttebeer is by far one of the most popular treats known to Hogsmeade and at the park you can get it in many forms, including the brand new Butterbeer Potted Cream. 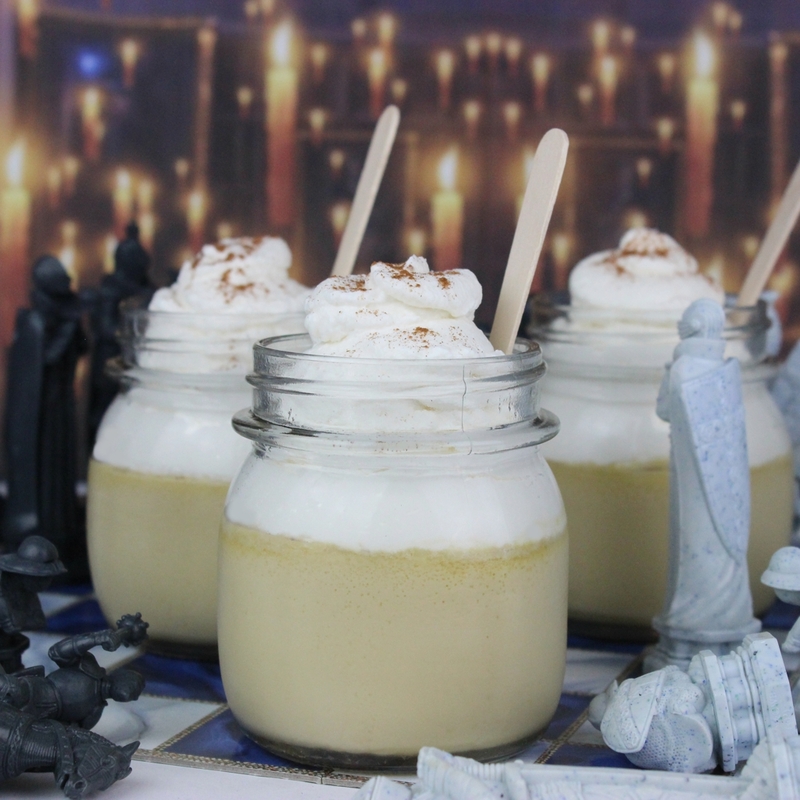 If you can’t make the journey on the Hogwarts Express, not to worry, you can make this fanciful treat at home for yourself. Topped off with a bit of edible floo powder and it will feel like you’re right in the thick of things with Harry and the crew. Preheat the oven to 325°. Ready a deep 9”x13” pan. In a saucepan over medium high heat, whisk together the butter, brown sugar and salt until melted and the sides start bubbling, stirring constantly. Slowly whisk in the cream and vanilla and bring to a boil. In the bowl of an electric mixer, whisk the egg yolks. Add a small amount of the cream mixture to temper, then slowly whisk in the rest. Strain the custard and pour into four ramekins. Put the ramekins into a 9x13 pan and place in the oven. Add boiling water to the pan, halfway up the side of the ramekins. Loosely tent with foil and bake for 40 minutes, until the custards set but are still jiggly. Let cool for 10­-15 minutes, then loosely cover with plastic wrap and chill in the refrigerator for 6-­8 hours. When you’re ready to serve, in a chilled bowl of an electric mixer, whip the heavy cream on medium high. Once peaks start to form add the powdered sugar, syrup and the vanilla. Turn the mixer onto high until stiffened. Pipe or spoon the whipped cream onto the pots de creme. Stir together the cinnamon, nutmeg and sea salt and sprinkle on top to serve. Jenn Fujikawa is a lifestyle and food writer. Follow her Twitter @justjenn and Instagram @justjennrecipes for recipes, DIYs and lots and lots of Star Wars treats.